Jan. 18, 2018, 7:30 a.m. to 9:00 a.m. The 1996 book the Clash of Civilization by Professor Samuel Huntington grew out of a 1993 Foreign Affairs article with a similar title. The article and the book took academic and nonacademic readers by storm. Today we still debate Huntington's thesis that the source of conflict in the new world will not be "primarily ideological or primarily economic ...but cultural." Huntington went on to say " For a century and a half after the emergence of the modern international system with the Peace of Westphalia, conflicts in the Western world were largely among princes-emperors, absolute monarchs and Constitutional monarchs attempting to expand their armies, their mercantilist economic strength and, most important, the territory they ruled." Along comes Professors Mahbubani and Sng with The ASEAN Miracle arguing that the young Southeast Asian population, now the 7th largest population group in the world and heading very quickly to number 5, uniquely deny the Huntington thesis. The cultures of these countries, according to the authors, are, yes, undeniably different, but their international politics do not follow the Western model. 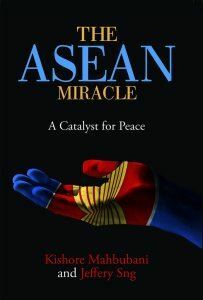 The authors argue that ASEAN, the Association of Southeast Asian Nations, "speak with one voice. Several issues are dealt with as a group, making it more difficult...for either China or the United States to pick countries off individually", that these countries do not have one dominant power in the group and that they act like a 'buffer zone' between other powerful nations or international organizations. Professors Mahbubani and Jeffery Sng squarely disagree with the global pessimists that are convinced that due to cultural differences, certain ethnic groups and/or nations will never find peaceful solutions. Yet, can the ASEAN model be useful elsewhere given the emergence of strongmen like Assad in Syria, Salen in Yemen, Ben Ali in Tunisa, Mugabe in Zimbabwe, Modi in India and Erdogan in Turkey? Such recent books, like Hubert Dreyfus and Dorrance Kelly's, All Things Shining and Mark Edmundson's Self and Soul, have questioned the loss of a hopeful r attitude toward questions regarding domestic and international Cooperation and peace. Their solution is a return to experiencing the wisdom of classical writers and artists in the past. While this is excellent advice, which whole heartedly recommend, a practical, less subjective and perhaps quicker method of achieving Cooperation and peace may be attained by emulating the ASEAN regional organization model. To prepare for the book review session, recommend one, observing the map of the ASEAN countries which proceeds page one, two, reading the book reviews at the beginning of the book, three, Googling book reviews, four, perusing the book's subject matter identified in the Table of Contents. The book's contents are divided into 6 sections; one, 4 waves of outside country immigration, two, the impact of Communism, strong leadership and market oriented policies, three, the ASEAN's relation to the Great Powers, four, pen sketches of the ASEAN countries, five, ASEAN's strengths and weaknesses and six, 3 recommendations to strengthen the ASEAN organization. Aside from section 4, the specific countries analyses which would take too much time, the session's questions will follow the other five sections of the book by asking members, what is the purpose of each section of the book? Finally, the last question asked will be, is the ASEAN model applicable to the future of the West?